Anita Desai is an Indian novelist and the Emerita John E.Burchard Professor of Humanities at the Massachusetts Institute of Technology. 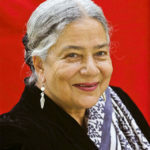 As a writer she has been shortlisted for the Booker Prize three times; she received a Sahitya Akademi Award in 1978 for her novel Fire on the Mountain, from the Sahitya Akademi, India’s National Academy of Letters; she won the British Guardian Prize for The Village by the Sea. "India is a curious place that still preserves the past, religions, and its history. No matter how modern India becomes, it is still very much an old country."